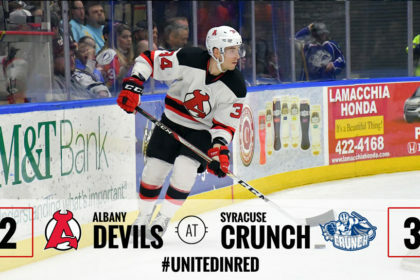 SYRACUSE, NY – The Albany Devils fell 3-2 to the Syracuse Crunch Saturday at the Onondaga County War Memorial at Oncenter. 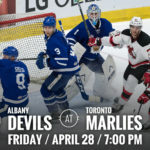 The Devils record falls to 37-31-2-3. 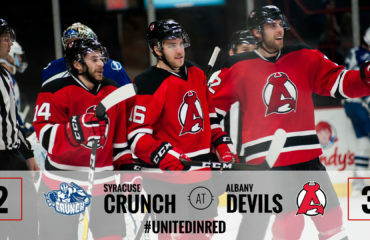 The Crunch improve their record to 35-24-7-7. 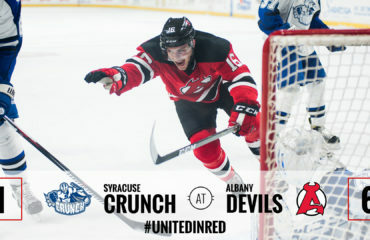 After a scoreless first period, Yohann Auvitu got the Devils on the board first at 5:20 of the second period after his shot from the point on the power-play made it through traffic in front of the net. 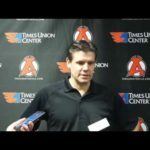 Carter Camper and John Quenneville earned the assists on the play. Syracuse’s Tanner Richard tied the game at one with a shorthanded goal at 10:51. John Kurtz picked up the assist on the tally. 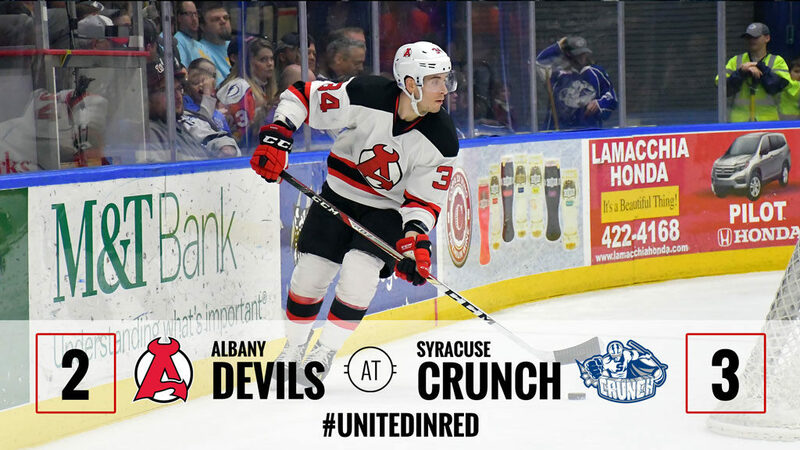 Dominik Masin scored at 17:14 to put the Crunch ahead 2-1 at 17:14 of the period with assists from Erik Condra and Matthew Peca. 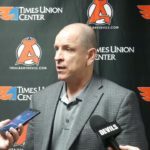 Kevin Rooney tied the game at two on a shorthanded goal after getting the second chance on a Brian Gibbons shot with 48 seconds remaining in the second frame. 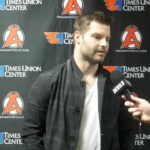 Karl Stollery picked up the secondary assist. Brett Howden netted his first professional goal and the game winner on a power-play goal at 16:38 of the third period with assists from Richard and Adam Comrie. 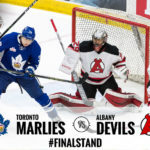 Mackenzie Blackwood turned aside 29 of 32 shots he faced and moves his record to 15-14-6. Kristers Gudlevskis blocked 24 of 26 shots and improves his record to 14-10-7. 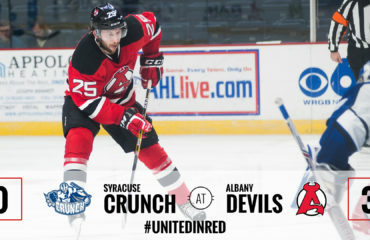 The Devils host the Hartford Wolf Pack Wednesday for a 7 pm puck drop.